behind the scenes work + a dresser — MD HANEY & CO. Lately my work has consisted of A LOT of administrative/paperwork type work. It always happens on the front end of larger jobs. But, there is a light at the end of my paperwork tunnel, which means I get to move onto the pretty and fun part! In the mean time, I have been puttering around the house and moving furniture here and there and organizing closets and such. 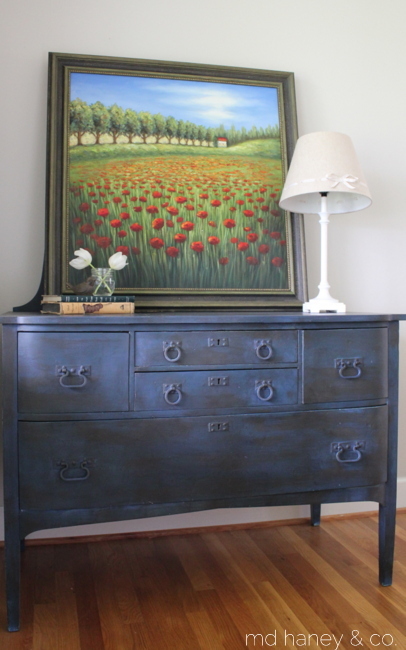 I painted this dresser a few months ago and it sits in our guest bedroom. The next room on my 'organization list' is the guest bedroom! I want it ship-pity sharp for our summer house guests….and it will probably take me that long to get it ready!